Somayajulu, D V L N joined NIT(REC) in September 1988 after completing M Tech from Indian Institute of Technology, Kharagpur in 1987. 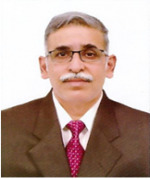 He received his Ph.D from Department of Computer Science & Engineering, Indian Institute of Technology, Delhi in 2002 and serving as Professor of Computer Science & Engineering since 2006. Currently, he is on deputation to the Chair of Electronics & ICT Academy at National Institute of Technology, Warangal. a) " Do What you Say, Say what you do, Prove it and Improve it"
b) " Every Successful person has painful story; Every painful story has successful ending; So Accept the pain and get ready for success"
Mohammad Ali Kadampur, Somayajulu D.V.L.N. Topic dependent cross-word Spelling Corrections for Web Sentiment Analysis. Context Dependent Bag of words generation. Index Tuning through Query Evaluation Mechanism Based on Indirect Domain Knowledge. 2010 IEEE 34th Annual Conference 152-157. A Noise Addition Scheme in Decision Tree for Privacy Preserving Data Mining. High Speed Data Perturbation Methods for Privacy Preserving Data Mining. Proceedings of The 2009 International Conference on Data Mining, DMIN 2009, July 13-16, 2009, Las Vegas, USA. Â· Proceedings of The 2008 International Conference on Data Mining, DMIN 2008, held at Las Vegas, USA, 2008. Vol 1, 115-125, June 2006. Organized 7th International Conference on Technology for Education (T4E2015) at NIT, Warangal during December 10-12, 2015. Role: Organizing Chair. Organized one day Pre-conference workshop as part of T4E2015 at NIT, Warangal on December 9, 2015. Organized one day Pre-conference workshop as part of BDA 2015 at NIT, Warangal on December 15, 2015. Coordinator for one week Faculty Development Programme on Inseminate Technical Institutes on OBE competence, R & D and IPR conducted by E & ICT Academy, NIT Warangal at G. Narayanamma Institute of Technology and Science for Women, Hyderabad from 19-24 June, 2017. Coordinator for one week Faculty Development Programme on Python and R Programming conducted by E & ICT Academy, NIT Warangal at Vignanï¿½? ?s Nirula Institute of Technology and Science for Women, Guntur from 19-24 June, 2017. Coordinator for one week Faculty Development Programme on R Programming for Engineers conducted by E & ICT Academy, NIT Warangal Raghu Engineering College, Vishakhapatnam from 12-17 June, 2017. Coordinator for one week Faculty Development Programme on Data Analytics with R conducted by E & ICT Academy, NIT Warangal at VNR Vignana Jyothi Institute of Engineering and Technology, Hyderabad from 15-20 May, 2017. Coordinator for one week Faculty Development Programme on New Trends and Methodologies in Engineering Education conducted by E & ICT Academy, NIT Warangal at PVP Siddhartha Institute of Technology, Vijayawada from 24-29 April, 2017. Coordinator for one week Faculty Development Programme on Statistical Analysis with R conducted by E & ICT Academy, NIT Warangal at J. B. Institute of Engineering and Technology, Hyderabad from 18-23 March, 2017. Coordinator for one week Faculty Development Programme on Business Analytics conducted by E & ICT Academy, NIT Warangal at R. V. R. & J. C. College of Engineering, Guntur from 11-16 March, 2017. Coordinator for one week Faculty Development Programme on Statistics with R conducted by E & ICT Academy, NIT Warangal at SRKR Engineering College, Bhimavaram from 13-18 February, 2017. Coordinator for one week Faculty Development Programme on Data Analytics with R conducted by E & ICT Academy, NIT Warangal at SPFU Directorate of Technical Education, Bangalore from 3-8 February, 2017. Coordinator for one week Faculty Development Programme on Software Engineering and Testing Methodologies conducted by E & ICT Academy, NIT Warangal at Swami Vivekananda Institute of Technology, Hyderabad from 28 January-2 February, 2017. Coordinator for one week Faculty Development Programme on Data Science and Big Data Analytics conducted by E & ICT Academy, NIT Warangal at Sri Vasavi Engineering College, Tadepalligudem from 20-35 January, 2017. Coordinator for one week Faculty Development Programme on Python and R Programming conducted by E & ICT Academy, NIT Warangal at Dhanekula Institute of Engineering and Technology, Vijayawada from 26-31 December, 2016. Coordinator for one week Faculty Development Programme on Statistics with R conducted by E & ICT Academy, NIT Warangal at NIT Warangal from 26 November-1 December, 2016. Coordinator for one week Faculty Development Programme on IOT for Emerging Technical Applications conducted by E & ICT Academy, NIT Warangal at PVP Siddhartha Institute of Technology, Vijayawada from 21-26 November, 2016. Coordinator for one week Faculty Development Programme on Data Analytics and IoT conducted by E & ICT Academy, NIT Warangal at Sasi Institute of Technology and Engineering, Tadepalligudem from 1-6 November, 2016. Coordinator for one week Faculty Development Programme on Data Warehousing and Business Intelligence conducted by E & ICT Academy, NIT Warangal at Gayathri Vidyaparishad College of Engineering (Autonomous), Vishakhapatnam from 19-24 September, 2016. Coordinator for one week Faculty Development Programme on HTML5 and Python Programming conducted by E & ICT Academy, NIT Warangal at Malla Reddy Engineering College (Autonomous), Secunderabad from 16-21 September, 2016. Coordinator for one week Faculty Development Programme on Analytics with R conducted by E & ICT Academy, NIT Warangal at Lendi Institute of Engineering and Technology, Vizianagaram from 16-21 June, 2016. Coordinator for DST sponsored Faculty Development Programme on Data Science and Big Data Analytics at NIT, Warangal during 6-15 June, 2016. Coordinator for two week Faculty Development Programme on HTML5 and Python Programming conducted by E & ICT Academy, NIT Warangal at Lakireddy Bali Reddy College of Engineering, Mylavaram from 6-15 June, 2016. Coordinator for two week Faculty Development Programme on ARM Programming conducted by E & ICT Academy, NIT Warangal at C ï¿½?? DAC, Hyderabad from 30 May-8 June, 2016. Coordinator for two week Faculty Development Programme on Security Engineering conducted by E & ICT Academy, NIT Warangal at C ï¿½?? DAC, Hyderabad from 30 May-8 June, 2016. Coordinator for one week Faculty Development Programme on Mobile Application Development for Android conducted by E & ICT Academy, NIT Warangal at C ï¿½?? DAC, Hyderabad from 23-27 May, 2016. Coordinator for two week Faculty Development Programme on Advanced Web Technologies conducted by E & ICT Academy, NIT Warangal at C ï¿½?? DAC, Hyderabad from 18-27 May, 2016. Coordinator for two week Faculty Development Programme on Database Management Systems conducted by E & ICT Academy, NIT Warangal at GITAM University, Vishakhapatnam from 16-25 May, 2016. Coordinator for one week Faculty Development Programme on Soft Skills conducted by E & ICT Academy, NIT Warangal at Sri Indu College of Engineering and Technology, Hyderabad from 16-21 May, 2016. Coordinator for two week Faculty Development Programme on Data Warehousing and Business Intelligence conducted by E & ICT Academy, NIT Warangal at CBIT, Hyderabad from 25 April-5 May, 2016. Coordinator for two week Faculty Development Programme on Data Warehousing and Business Intelligence conducted by E & ICT Academy, NIT Warangal at VRSEC, Vijayawada from 20-30 April, 2016. Coordinator for two week Faculty Development Programme on Software Engineering conducted by E & ICT Academy, NIT Warangal in association with Infosys, Bangalore at NIT Warangal from 28 December, 2015-8 January, 2016. Remote Center Coordinator for two week ISTE STTP on Introduction to Design of Algorithms conducted by IIT Kharagpur from 27 April-30 May, 2015. Workshop Coordinator for two week ISTE STTP on Pedagogy for Effective Use of ICT in Engineering Education conducted by IIT Bombay from 5-31 January, 2015. Organized Inter-NIT Interaction Workshop on Curriculum at NIT, Warangal during 22nd -23rd December, 2014. Remote Center Coordinator for two week ISTE Workshop on Cyber Security conducted by IIT Bombay from 10-20 July, 2014. Remote Center Coordinator for two week ISTE Workshop on Computer Networking conducted by IIT Bombay from 28 May-5 July, 2014. Remote Center Coordinator for two week ISTE Workshop on Computer Programming conducted by IIT Bombay from 20 May-21June, 2014. Remote Center Coordinator for two week ISTE Workshop on Fluid Mechanics conducted by IIT Kharagpur from 20-30 May, 2014. Coordinator for A 5-day Technical Workshop on Architecture, Algorithms, Analytics for Big Data using Cloud and Distributed Computing (abcd-2014) from 7-11 March, 2014 (jointly organized with Dr. V. C. V. Rao, C-DAC, Pune and Dr. R. B. V. Subramanyam, CSE-NIT-W as coordinators) with funds from TEQIP-II project of NIT-W. (65 participants). Remote Center Coordinator for two week ISTE Workshop on Engineering Mechanics conducted by IIT Bombay from 26 November-6 December, 2013. Remote Center Coordinator for two week ISTE Workshop on Analog Electronics conducted by IIT Kharagpur from 4-14 June, 2013. Remote Center Coordinator for two week ISTE Workshop on Database Management Systems conducted by IIT Bombay from 21-31 May, 2013. Coordinator Finishing School for Engineering Graduates and MCAs among SC Youth Jan 16- March 16, 2013. Remote Center Coordinator for two days ISTE Workshop on Research Methods In Educational Technology conducted by IIT Bombay on 2 & 9 February, 2013. Remote Center Coordinator for two week ISTE Workshop on Engineering Thermodynamics conducted by IIT Bombay from 11-21 December, 2012. Aakash Coordinator for Two Day ISTE Workshop on Aakash For Education conducted by IIT Bombay from 10-11 November, 2012. Remote Center Coordinator for two week ISTE Workshop on Introduction to Research Methodologies conducted by IIT Bombay from 25 June-4 July, 2012. Remote Center Coordinator for two week ISTE Workshop on Computational Fluid Dynamics conducted by IIT Bombay from 12-22 June, 2012. Coordinator for Workshop on Database Security during March 5-9, 2012 under ISEAP. Remote Center Coordinator for two week ISTE Workshop on Solar Photovoltaics: Fundamentals, Technologies and Applications conducted at IIT Bombay from 12-22 December, 2011. Remote Center Coordinator for two week ISTE Workshop on Database Management Systems conducted by IIT Bombay from 13-23 December, 2010. Organized prestigious 23rd Indian Engineering Congress jointly with The Institution of Engineers (India), Kolkata during 11-14, December 2010. Role: Organizing Secretary. Coordinator for MHRD, Government of India sponsored Refresher Course on Data Warehousing and Data Mining conducted from March 23-29, 2009. Coordinator for MHRD, Government of India sponsored Refresher Course on Data Mining: Concepts, Techniques & Research Trends during 1-13 June, 2009. Coordinator for MHRD, Government of India sponsored Refresher Course on Advanced Database Systems during 15-27 June, 2009. Organized TEQIP 10th Joint Review Mission (JRM) at NIT, Warangal during 19-23, January 2009. Coordinator for MHRD Govt. of India sponsored FDP on Project Management during 24th August to 5th September, 2009. Coordinator for Finishing School for Engineering Graduates (FSEG-2008) a two-month training programme on Information Technology for 121 students from May 5, 2008 to July 4, 2008. Coordinator for conducting two-week MHRD Govt of India sponsored Advanced Technology Programme on Data Mining: Next Generation Challenges from June 23- July 5, 2008. Coordinator for TEQIP sponsored 5-day Faculty Development Programme on Data Warehousing & OLAP Tools from 22-27, September, 2008. Coordinator for two week Refresher Course on Information Systems & Modelling organized by department of CSE from May 19-31, 2008. Coordinator for 10 week Finishing School for Engineering Graduates (FSEG-2007) a two-month training programme on Information Technology for about 120 students during May- July, 2007. Organized two day workshop on DNA of Finishing School for Directors, Principals and HoDs of various engineering Colleges during July 2007. Coordinator for 3 day workshop on Data Mining using Clementine Workbench during 1-3, June, 2005. Organized on day workshop on Entrepreneurship: Is Open Source the Future? On 8th November 2005. Coordinator for two week ISTE sponsored FDP on Recent Trends on Data Warehousing and Data Mining during March 22 - April 2, 2004. Actively participated in conducting four day VLDB Summer School on Frontiers of Database Technologies under supervision of Prof S K Gupta, IIT- Delhi during 1-4, June 2004. Conducted five day training programme at IBM Global Services Pvt. Limited, Bangalore on Oracle 8i during 2002. Conducted five day training programme at IBM Global Services Pvt. Limited, Bangalore on Oracle 8i during 2001. Visited USA, UK, Singapore, China, Russia, Austria, and Dubai for presenting research papers in International Conferences during 1998-till date. Received Best Engineering Researcher Award in September 2015 jointly awarded by National Institute of Technology, Warangal and NIT Alumni Association in recognition of Research, consultancy and training in the field of Computer Science & Engineering. Received Best engineer of the year award in September 2007 on the occasion of 40th Engineers day celebrations in commemoration with 147th Birthday celebrations of Engineer Statesman Bharat Ratna Mokshagundam Sir M Viswesaraya by Govt of Andhra Pradesh and IEI, AP State Centre, Hyderabad. Nominated as Mentor to Three colleges under NEQIP by AICTE, Delhi for a period of three years from June 2014. TEQIP phase II Implementation and Monitoring Committee Member - Software Expertise, LRs and Finishing Schools at NIT, Warangal in 2013. Technical Committee member at NPIU as part TEQIP Phase II World Bank funded project and invited for participation in several meetings for evaluation and software development of the PMSS software at NPIU Delhi during academic year 2009-2012. Technical Committee member at NPIU as part TEQIP Phase II World Bank funded project and invited for participation in several meetings for evaluation and software development of the MIS software at NPIU Delhi during 2009-2011. Nominated as Performance Auditor to Govt. Mahila Engineering College, Ajmer for monitoring TEQIP II world bank funded project from 2012 by NPIU, New Delhi. Served as MIS in-charge at the Institute for a period of 3 years seven months from 7th August 2006. Institute Level Coordinator for the NMEICT activities ( Workshops and A View discussions and Aakash Project of IIT, Bombay) at NIT, Warangal during 2009-2016. Library Advisory Committee Member, Central Library, NIT, Warangal during 2012-13.